Stances, at least from my point of view, are grossly misunderstood in traditional martial arts around the world. In this article I am going to give my view on the topic. Like so many other aspects of the Asian martial arts, when they arrived in Western Countries, the first thing we did was misinterpret everything. In other articles on this site I have mentioned the way blocking is not really blocking, and how one-step sparring was an off-shoot of a much bigger process in bringing a student to a certain level of fighting proficiency. Stances fall into this same category – wholly misinterpreted. As a person who spent much of his life training in a system where stances are the signature of the entire style, this was a hard to gain understanding. My instructor insisted that stances be done a certain way, and nothing less than perfect replication was acceptable. As such, my stances never were acceptable. 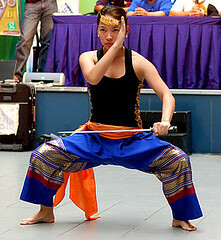 In Hung Gar, the common saying regarding the Horse stance is that the thigh bone must be parallel to the floor. This is the goal I was taught, and for years this was the goal I taught my students. The problem with thigh bone parallel to the floor is that, while one has dug a hole and made a strong base, it is not possible to move well from such a position. I have no intention of getting into a debate on the correct way to perform individual stances; thigh bone where, toes pointed here or there, and all of that. That is just pointless. The correct way to perform stances is a much smaller problem than how the stances themselves are to be understood. Stances, no matter how much anyone argues to the contrary, are intended to be transitional. Stances are to be a posture we pass through, not stop at. Imagine you were on a jury in a trial, and the case was one of assault. As a part of the proceedings, you are shown a series of still photographs of the assault. In one picture you see the accused grab the victim by the lapel. In the next you will see the fist drawn back, and perhaps the accused is in a “stance” that resembles a back stance. In the next picture you see the accused in what appears to be a front or forward stance as he delivers a vicious punch to the victim’s face. You may or may not be moved by this series of photographs. But then the prosecution produces a film of the same incident taken from a security camera. In the film, you will never see the stances, and the violence will be much more intense. Forms or Kata are at photographs. We are learning the techniques contained therein. When we focus on the application held within the forms, we should be able to quickly see that when we practice, for example, checking our forward momentum, this is done solely to keep us from depositing our face on the ground, not because that is how we will execute the technique in a real fight. This is where application drills become so much more important than the rote practice of kata itself. Next Post Kris Wilder Seminar in North Texas!